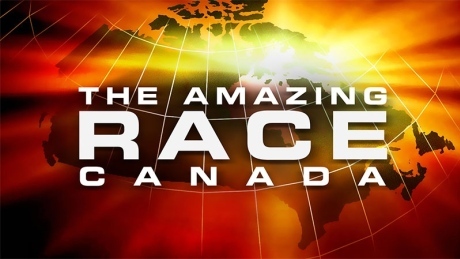 I've always enjoyed watching the Amazing Race show on TV. If there are any of you out there who are not familiar with the show, it is a race around the world where teams of 2 travel to far off locations and once there, complete some task or challenge against other teams to earn the clue to their next destination. I've always enjoyed watching the various teams struggle through the many challenges and tasks around the world, often thinking to myself, "I could do better than that!" I've also sat there thinking, "If I were to compete on this show, who would I want to have as my teammate?" As I've gotten older the desire to compete on the show has slowly reduced. It's not so much because I enjoy it less or think that I can no longer complete the tasks (although ethnic dancing for a clue is not really my thing...), but rather because of the many travels that I've already had around the world shaping my idea of the "fun" of the Amazing Race. In the last three months I've had the opportunity to travel to Africa from Mongolia two different times. There are several ways to get from Ulaanbaatar (why has the Amazing Race never come here?) to various countries in Africa, but usually the most affordable and most direct option takes me through the country of Turkey on Turkish airlines. My first visit back to Africa came unexpectedly and gave me a brief glimpse of the craziness that must be a part of the Amazing Race show. 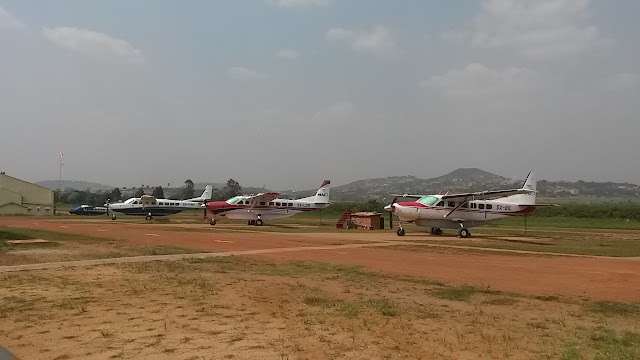 I had to travel to Uganda because our MAF training base is located there, and I needed to do another of my check flights that is required of every MAF pilot every 6 months. Now normally we do not fly off across several continents to do these check flights. Normally, we have a check pilot who comes to Mongolia and flies in our aircraft with us here. This WAS originally our plan, but a couple of weeks before he was supposed to come here, our check pilot was riding his bike (pedal, not motor) and in a brief moment of not-paying-attention-to-where-he-was-going, he crashed and did substantial damage to his body. Long story short, he couldn't come. FYI, he is healing and will be ok. Things like this normally take about 1 month to arrange. We need to apply for a visa from here in Mongolia, and when our side of the application is completed we send the information to the other person, who then has to apply for their visa from whatever country that they are in. This all takes time, which in this instance we didn't have. As a result, I found myself on short notice winging my way over a bunch of the "stans" as I traveled from Mongolia to Uganda. This trip was as close as I think I ever want to come to participating in a leg of "The Amazing Race". 10:30: Scheduled departure time. Aircraft has not yet arrived from inbound flight. 11:45: I board the aircraft, find my seat, and sit down. 12:30: Still sitting. Aircraft not moving. Engines not even started. We are now 2 hours late. I have a 1.5 hour layover time in Istanbul. I haven't even left Ulaanbaatar yet and I've already missed my connecting flight. Oh boy. 12:33: Aircraft pushes back from the gate and engines start. IT'S ABOUT TIME! 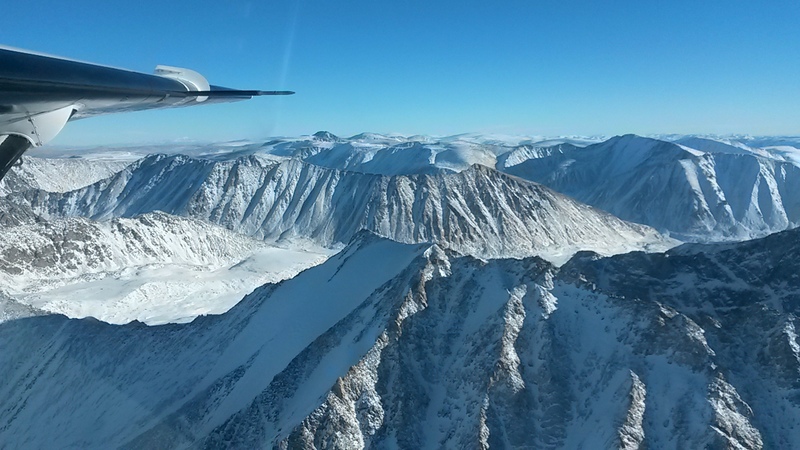 16:00: Land in Bishkek, Kyrgistan for scheduled short 1 hour refueling stop. 17:30: Re-Board aircraft (we're even later now). 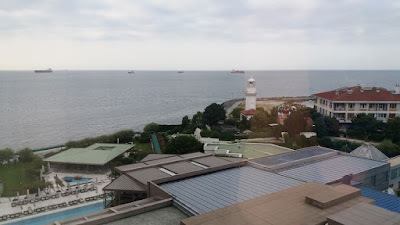 18:35(local time, after a 4 hour flight): Land in Istanbul. I look out the window as we land, where I can probably see the aircraft that I'm supposed to be on, taking off for Uganda. Sigh. a great hotel for the night and have given me vouchers for meals while I'm there. Looking out from my room I can see the sea. Nice. I'll be here for the next 20 hours until the next flight to Uganda. Time for bed. 16:30: I am waiting for my shuttle vehicle to come and take me to the airport for my flight. It comes. 17:20: I have checked in and am through security and immigration at the airport. Waiting for my flight. 17:50: Aircraft is boarding. I get on and find my seat. I begin to relax a little bit. 18:40: We take off for Uganda. I relax more completely. 02:45: We land in Uganda. Even though it is the middle of the night I still recognize many things on the ground as we fly our approach into the airport, an approach that I have flown myself many, many times. 03:08: I find my driver, waiting for me. I am glad that he is there and I am there, at the same time. We leave the airport. It is much faster when I do not have any checked baggage. 04:00: I arrive at my accommodations in Kampala. I go to bed. 07:00: I wake up. Yay for jet-lag. 09:00: I walk to the MAF office and get a vehicle. I drive through the crazy Kampala traffic and make my way out to the Kajjansi airfield. It all still feels very familiar to me, even though it has been 2 years since we lived here. 10:30: I climb into the airplane and do my check flight. I am glad that I am doing it now in the morning before the jet-lag really smites me. It goes... ok. Better than I had been hoping for. If there was no tiredness or jet-lag, it would have been better. In Amazing Race vernacular, task completed! 01:00 (that's very, very, "AM"): I get into my waiting taxi to drive to the airport. 01:50: I arrive at Entebbe airport 23 hours after landing in Uganda to check in for my flight back to Mongolia. I go through security immigration with no problems. Check in is very easy with only carry on baggage. 03:00: I board the aircraft. I am flying out with the same crew who were on the aircraft that I flew in on. One stewardess recognizes me and says "Hello!". I can tell that she's wondering what brought me all of the way to Uganda for less than one day. I am impressed that she recognized me. I must look like a chewed up piece of meat. 03:40: We take off, heading back to Turkey. I settle into a movie. It is 08:40 in Mongolia, so there is no point in trying to sleep now. I can sleep later on when I am flying on my next flight. 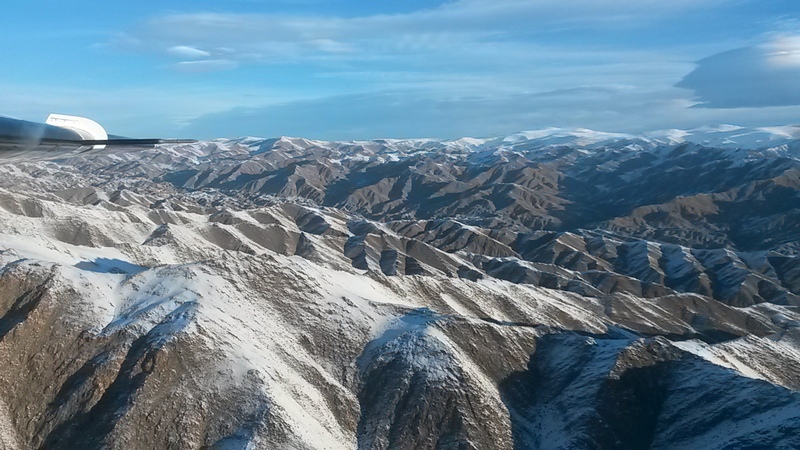 23:00: We are descending into Bishkek again. I wake up and look around. I always look around when I wake up on an airplane to see if anyone is looking at me with that, "Finally, the snorer has woken up!" look on their face. This is even more true when I am the pilot (I am kidding. I don't sleep when I'm the pilot. Really. I hope everybody understands that I was kidding). As far as I can tell, nobody cares that I have woken up. Good. 10:07: We land in Ulaanbaatar (Why has the Amazing Race never come here?). 11:45: I arrive back home. I manage to make it for a few hours before I crash on the couch for an hour or so. When I awaken, my kids tell me that I was snoring. I don't care. Three continents, 7 flights (there was a short hop that I didn't mention), 6 cities, 14,125 miles, 97.5 hours. I am home and checked out so that I can fly for another 6 months. I am officially glad that I only had one leg to do and not 9 or 10 more. I can only imagine how utterly exhausted and constantly jet-lagged the contestants on the Amazing Race must be after several weeks of running around like that. I can't imagine being so zonked out of my head with jet-lag, and then having to do those challenges which include getting taxis in foreign lands, language issues, culture issues, the challenges that they have to do, plus trying to remain civil with their running partner while just yearning for a pillow. Yep, I'm glad that it's not me. Watching them run around on TV is plenty good for me. I do have a better understanding of all of the bickering that happens on the race. Oh well, it makes good TV I guess. Last week I had the privilege of flying a special group of ladies around Mongolia in my plane. "Nurses Heart to Heart" is a small charity out of Atlanta, Georgia. Anita, who runs NHTH, was in Mongolia several years ago as a nurse carrying out a medical transfer for a patient who needed to go to America to have heart surgery. While she was in Mongolia, she was approached by a local Mongolian nurse and asked if Anita could show her (the Mongolian nurse) how to do CPR. 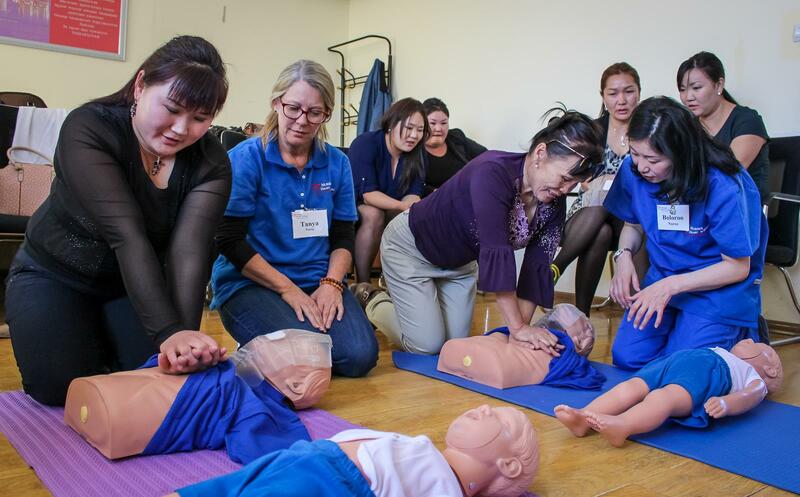 She quickly realized that there was little to no knowledge of CPR in the medical profession in Mongolia, and NHTH was born out of that experience. Since then, Anita and her group of nurses have returned to Mongolia every year, visiting new provinces and giving CPR training to the medical professionals in each province. This year, the trip began early on Sunday morning. I was out at the airport and had my airplane ready to go for a 6:30am departure, and the nurses showed up right on time. This year the group consisted of the 3 nurses from the US, our Mongolian translator, and 4 Mongolian nurses who have worked with Anita in the past. We loaded up the plane with their baggage and the CPR mannequins, and were airborne right on schedule. Leaving Ulaanbaatar in the early morning hours. Our first stop was the town of Dalanzadgad, located in the south Gobi desert, about a two hour flight south of Ulaanbaatar. We landed at their local airport and were at the local hospital by 9:30 that morning. For me it was the first time to go through their whole CPR class process, but they have done it enough times in the past that it didn't take long to get everything set up, and before long the first group of people were absorbing the lesson. Anita and Sarah (the translator) have done this for many years, and it didn't take them very long to get back into the speak,translate,speak,translate groove. Sarah has worked with them and has translated many, many lessons over the years and she is able to do very good translations, even adding additional information at times when appropriate. It took a while to get fully into the swing of things, but when the nurses got down on the floor to practice with the CPR mannequins, things really loosened up and the laughter and fun learning environment really helped all of us to get into the lesson. For almost all of these nurses and doctors, they had no real knowledge of this basic lifesaving skill. Some had read about it in a book or maybe sat through a lecture at some point during their medical training, but for almost every person who was trained on the trip, this was the first time that they were able to physically learn and practice the skill using practice dummies. After the classes were finished, the local hospital administrator and Anita would sign a certificate for each of the ladies to certify them for CPR, and when they were presented with their certificates they were also given the opportunity to receive a Mongolian Bible. Although not every person decided to take a Bible, many did. It was a fun time to watch them walking out of the room discussing their new skill, holding on tightly to their certificate and Bible. After that first class we all quickly fell into a routine. We took time to enjoy our lunch, then we were back at it with another class of nurses and doctors that afternoon. What was my role in this whole thing? Well, when we first walked into the room that morning, Anita turned to me, passed me her camera, and said, "You will be our official photographer, if you're all right with that." Although I am not a great photographer by any stretch, I do enjoy taking pictures, so that became a primary responsibility for me. I also helped out with set up, take down, and anything else that needed to be done. Sunday passed for us all in a blur of activity. The ladies from the States were still really feeling the jet-lag from their trip over to Mongolia, and I had been up early to get out to the airport in time. Once we landed, we had just been going non-stop, so when our heads all hit the pillows in our rooms that night it was no trouble to fade off to sleep. Monday morning was nice, as we were able to "sleep in" and get rested up a little bit more. We were staying in Dalanzadgad that day and weren't flying anywhere else until Tuesday morning. After a small breakfast we headed back over to the hospital and prepared for yet another class that morning. By this time everyone was finding their "groove" and the class flowed very smoothly throughout the morning. It wasn't long before the class was empty again and we cleaned up and headed back to our hotel. There was no class scheduled for that afternoon, and we were able to take the time to do a little bit of sightseeing. There is a range of mountains near Dalanzadgad where, if you take the time to drive out there, there are several valleys where you can walk out on the thick sheets of ice that build up over the cold season. It was fun to take some time and relax a little bit and have some fun out in nature. A gap between two layers of the ice, running back into the ice sheet. Tuesday morning came early, and we were all back out at the airport just as the sun began to peak over the horizon. Once again we loaded everything into the plane and headed north one hour to the town of Mandalgobi. We were on the ground there by 7:30am, and we once again were able to quickly check into our hotel and by 9:00 we were at the local hospital and setting up for classes. Although the setting was different, the classes once again went very well and smoothly. Once again the nurses conducted CPR classes in the morning and again in the afternoon. By that evening I was really feeling the early mornings and busy schedule of the past days and weeks, and I excused myself after supper to head to my room to get some much needed sleep. After I left their company that evening, the ladies were able to get in touch with a local pastor and were able to visit his small church and encourage him in his work there. Wednesday followed a very similar pattern to the previous day. We were up with the sunrise again and headed west to the small community of Arvaikheer. The initial plan had been to conduct two CPR classes during the day, then the following day was left fairly open so that the team could spend a little bit of time sightseeing and experiencing the community before we were to fly out on Thursday afternoon. When we arrived at the hospital that morning, the administrator was talking to Anita and mentioned something about doing three classes. Further questioning revealed that they were anticipating and planning on having two classes on Wednesday and one more class on Thursday morning. Anita quickly and graciously changed the plan to allow for the extra class on Thursday morning, and we got to work. One thing that I have not mentioned yet is that before we left each province, the NHTH ladies would donate several CPR mannequins and a few other basic medical supplies to each hospital so that they would be able to practice their skills and hopefully also teach others these skills as well. Because of this, each class took a little bit longer than the previous class to teach as there were fewer and fewer CPR mannequins available for practice at each stop. By the end of the day on Wednesday I could see that the level of tiredness and fatigue was reaching a fairly critical level with the entire team. Although everybody was feeling drained, this kind of trip doesn't come along very often and we all piled into a van to drive out into the countryside to visit a local family. Our experience that afternoon speaks volumes about the hospitable nature of the Mongolian people. Of course the family had no idea that we were coming, yet when we showed up on their doorstep they immediately dropped everything that they were doing to welcome us into their ger (yurt) and extended every hospitality to us while we were there. The ladies were able to ride a Mongolian horse, and they even offered us their extra dress-up traditional clothing for picture taking. It was a lot of fun to visit for a short time and spend that time in the company of that family. Myself, Mariana, Tanya and Anita with the Dad, Grandma and Son of the family. Thursday morning came quickly, and it seemed to take everybody a little bit more effort than usual to get through the class that morning, but everybody pushed through the tiredness. I had my pilot brain in already in gear for the flight back to Ulaanbaatar (UB) that afternoon, and when the afternoon forecast changed quite drastically we were forced to pick up our bags and rush out to the airport as fast as we could. There had been a small chance of light rains in UB that afternoon, but the latest forecast called for snow mixed with rain as well as reduced visibility that afternoon which would prevent us from flying back to UB that day. We were able to bump up our departure time on short notice, and we found ourselves back in UB in front of the weather that afternoon. Our flight path for the week. Although it was a very busy and tiring week, it was also incredibly rewarding. Many doctors and nurses were taught a basic skill that has the potential to save numerous lives in the future, and most of those people also walked away from the class with a Bible that we hope and pray will be opened up and read by those who received them. I got to know the 3 ladies from Atlanta quite well and I joked that they were my 3 Moms (Mums for you Brits out there) for the week. I think that Mariana, being only a few years older than I, felt a little old when I said it like that, but I figured that we could simply ignore those pesky age gap considerations! Anita and Tanya both have children who are around my age, so it wasn't a stretch for them. Early on Saturday morning the ladies boarded their flight back to Atlanta, and just like that they were gone! It is an honor and privilege to be able to fly groups like this, and to help out in whatever way is possible during our time together. I look forward to what will come next! It's been a while since I've written anything here. I don't like to write here just for the sake of putting something out there, but I'd rather wait until there is something that I want to share before I sit down to write. The last couple of months have been, umm, (say it slowly) s.l.o.w for flying here in Mongolia. From what I understand, this is not unusual for this time of the year. When the cold weather hits, many people leave the country and head for places where the weather is a little easier to live in. Those that remain behind don't travel very much, as if there are any problems their life can be in jeopardy if their vehicle breaks down. As a result, my flying also slows way down. Any flying that does happen over winter ends up being medical flights when we are called on to fly the sick or wounded. This year, even that has been very limited. For most of the month of January, our airplane was grounded in the hangar for some much needed maintenance. We had one of our MAF colleagues from Australia come up for 2 weeks and perform a vast number of checks and work to the avionics on the plane. We also were able to do some maintenance that needed to be carried out, but which is hard to do when the plane is flying regularly. Once the maintenance has been finished, we waited again as the Mongolian authorities checked over the work and did a few inspections before issuing us our certificate of airworthiness for the next 12 months. Many people don't realize, but airplanes can't fly without an overwhelming amount of paperwork being done. Tongue in cheek, the rule of thumb is that until your paperwork weighs about the same as your plane, you haven't done enough of it. Because our airplane was fixed to the ground for so long, it created a small problem. Twice a year I have to fly what we call a "base check". Think of it as a mini flight test with MAF approved check pilots. If my base check expires before I have another one done, I can't fly until I do get it done. In a program where there are multiple pilots it usually isn't a big deal if one pilot is "out of check" for a day or two before doing his base check. For me, if I don't get my check done, the whole flight program grinds to a halt until it is carried out. With me unable to use our plane, the check pilot who was scheduled to come here and check me had to cancel his flights and I wasn't able to do my check. As we discussed the available options, one stood out as being the most logical. I could fly down to Uganda and carry out my base check there while our plane here was still grounded. That way, when our plane was ready to fly again, I would be as well, and there would be no unnecessary delay. So it was, on the morning of the 6th of February, I headed out to Chinggis Khaan International airport and caught my Turkish Airlines flight out of Ulaanbaatar and over to Istanbul, Turkey. There I had a short layover and was soon on another Turkish flight, heading southwards for Entebbe, Uganda. I arrived early on Sunday morning and was soon quietly slinking through the door of the house where I was to stay for the next few days, trying not to wake up our friends who live there. I tried to grab a couple hours of sleep before everyone else woke up, but I had a hard time falling to sleep because my brain found Kampala to be so quiet (there's a sentence that I never thought I would write)! It was so nice to be able to see the Wunderli family again, who became close friends of our while we were in Uganda. Their kids have grown like weeds in the time that we have been gone, and it reminded me how much my own kids have been growing lately. It was a pleasure for me to be able to join them and attend the church that we had gone to when we lived in Uganda. I spent the rest of the day with the Wunderli's, visiting and even managing to play a few games before finally crawling into bed that night. Uganda is 5 hours behind Ulaanbaatar (UB) time, so it was no problem for me to fall asleep after staying awake for the entire day. The next morning I awoke feeling very rested and refreshed, and headed out the door with Simon (Wunderli) to make our way to the airfield for my flight. Traffic in Kampala is still traffic in Kampala, and reminded me that traffic CAN be worse than the traffic in UB. 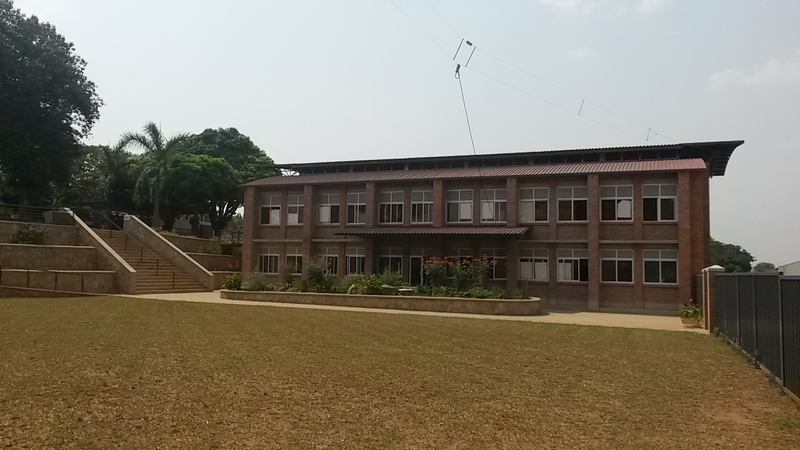 One of the big changes in the MAF Uganda program since we have left there is that the main MAF office has moved from Kampala out to Kajjansi airfield, where everything is now done from one location. Our family left just a few weeks before the office moved, and so everything there was new to me. It was great to be able to walk through the door and greet all of the friendly faces that I had not seen in 7 months. 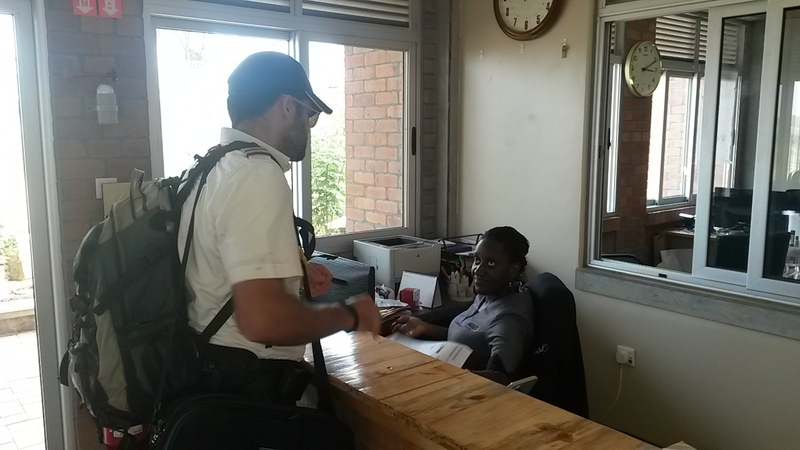 The new office looks great, and even though there have been many "new office issues" to work through, it was easy to see that the space was a much, much better fit than the small, cramped quarters that they had been using in Kampala. MAF Uganda pilot Dave Forney talks at the front desk with the receptionist, Evelyn. 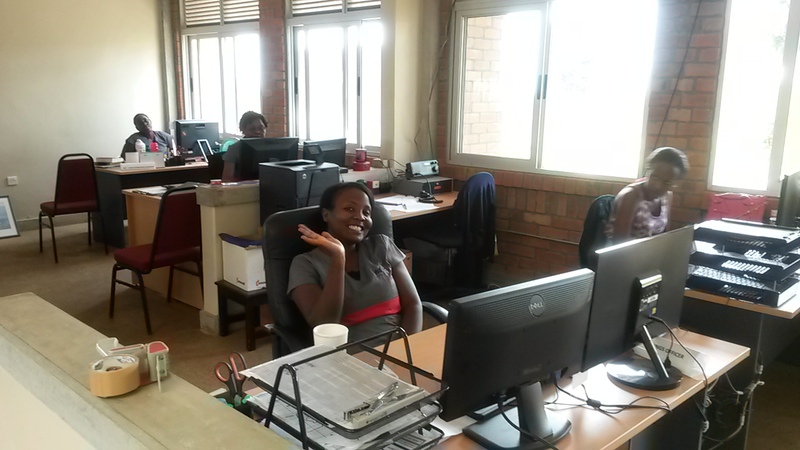 The bookings and operations ladies, in their new, more spacious location in the new office. After looking around the office and getting my bearings, I headed out to my ride for the day. My plane that I would be flying for my base check was an old friend, 5X-FRM. 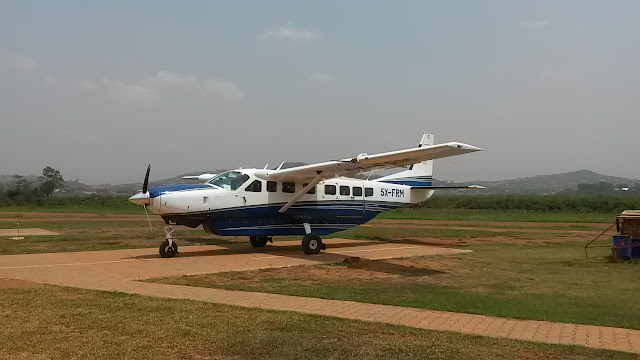 FRM is a plane that is owned by Far Reaching Ministries (FRM), and is maintained and flown by the MAF Uganda crew. Even this plane had changed since I had flown it last, as it was now boasting a new FRM paint scheme that had been put on it in the time that I had been away. It was a great feeling to be able to sweat and be warm all of the way to my bones as I did my pre-flight checks on the plane that morning. 5X-FRM, my ride for the morning, boasting its new paint scheme. The flight line that morning, with one airplane already in the air. With the plane checked out and everything looking good, we belted into the captains chairs and taxied out onto the red murram airstrip. I was surprised both by how much I had already forgotten about flying at Kajjansi and also by the things that I still remembered. It had also been 7 months since I had flown behind a "glass cockpit", and remembering how to work the modern avionics and where to look to find the information that I needed took a little time before coming back to me. One of the nice things about flying is that planes fly the same everywhere in the world. The laws of physics don't change from Mongolia to Uganda to Canada, so I was still able to do a decent job for my base check. It was a little tougher than it would have been if I had flown it here at UB where I feel at home, but it was still very special to be able to fly in Uganda again, even if only for one short flight. That evening I was able to join Dave and Joy Forney at their house for supper, and had a great time with them and their family. They are another family who became good friends of ours while we were in Uganda. It was a little sad that Karen and the kids were not able to join me, but with such a quick trip it just wasn't practical, or economical! Tuesday was a great day. I had no flight commitments that day, and my own flight back to UB didn't leave until late that night (early Wed morning). After a bit of a lazy morning I was able to meet up with Dave and Jana McPhee, friends of ours who I grew up with back in Canada. 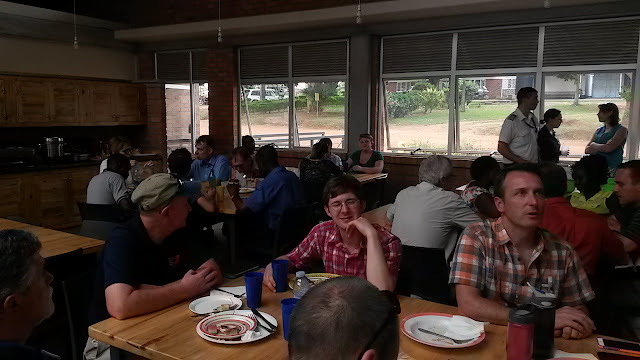 They work at Restoration Gateway in northern Uganda, and they made the trip down to Kampala just so that we could meet and enjoy lunch together! We did enjoy our few hours together, and I was even able to expand their "bubble" of known roads and places in Kampala, as I directed them through traffic on a route that they had not known of before. It was so good to be able to see them. Supper that evening was with Greg and Jill Vine, more friends from our time in Uganda. After a good visit with them, I headed back to the Wunderli house to say my goodbye's to them before we all headed for bed. I was able to get in a few hours of sleep before hearing my taxi drive into the yard at 1:00am. My flight left Uganda at 4:55am, and scarcely 23 hours after that I found myself looking out the window at Ulaanbaatar as I landed back home. I have to admit, the whole trip was a little surreal. I wasn't expecting to be able to go back to Uganda, and it was all over in the blink of an eye. I'm glad that things all worked out this way though, as our plane now has all of it's paperwork in place and I have my base check completed and am ready to fly. Now we will be able to continue fly any medevac requests that come through, and continue to prepare for the busy summer of service that lays ahead of all of us here at Blue Sky Aviation. Who knows where I might end up next! As the Canadian philosopher Red Green would say, "It is winter." In a lot of ways, winter here in Mongolia reminds me of winter back in Alberta. Cold weather and snow. Slippery roads at times and a few days of poor visibility for flying. This morning when I walked to the office the temperature was -28 degrees Celsius. That's kinda normal for the last while. The first time that the temperature dropped down it was a bit of a shock for our systems, as it has been a number of years since our bodies have experienced anything below +18, and the cold weather did hit us a little bit. It didn't seem to take too long for us to remember how to cope with the cold however. Back in November we had a couple of really cold weeks where the temperatures were down in the mid-thirties. -38 was the coldest that I am aware of, but that was a bit of a shock to the system. That shouldn't happen until January, not in November! With the cold weather and wintery conditions comes a huge reduction in the amount of flying that we do here in Mongolia. For the next several months until warm weather returns to the country we will be flying almost exclusively medevac flights. The last scheduled flight that I flew was a couple of weeks ago when I took a group to the far reaches of western Mongolia. It was the first time that I had flown into that particular area, and once again I was amazed at the beauty and grandeur of this country. 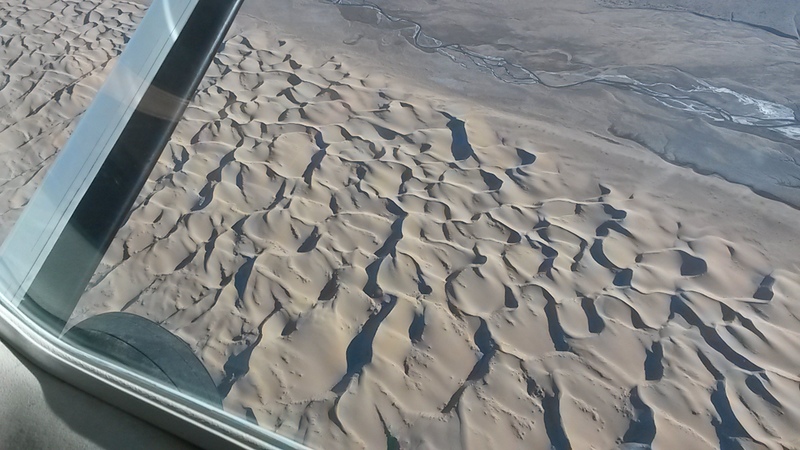 It still blows my mind that I can be flying over huge sand dunes in the desert one minute, and 10 minutes later be flying over immense mountains with rocky peaks and impressive valleys. I have realized that this Canadian boy likes the winter, even more than I knew before. I love the feeling of the cold weather biting into my cheeks and making my face numb with cold. I like the feeling of the top of my legs getting cold as I walk outside, almost to the point of becoming numb, and then the feeling of them warming back up when I come inside. I love the challenge of doing things with bare hands in extreme cold, like opening padlocks, opening the cargo pod doors on my plane, or various other tasks, pushing myself to do as much I can with my fingers before they stop working properly and I have to warm them up before they move properly again. I love blowing warm, moist air out of my lungs and watching my breath condense and form a cloud in front of my face while I breathe. There are a lot of wintery, cold weathery things that many people dislike about winter that I find myself enjoying. Of course, there are also things that I still don't like. Entering a warm room and being instantly blind as my glasses fog over still annoys me. Spending most of the day with mussed up hair because I have to wear a tuque (Canadian word for a knitted winter cap) and it messes the hair up when it is pulled off is also a pain in the heiny. There are other things, of course. If we owned a vehicle here there would be the added nuisance of dealing with keeping our vehicle healthy and running well through the cold weather. Carrying groceries home anywhere from 1/2 mile to 1 1/2 miles away can be mildly annoying, especially if it was a milk run and the backpack is heavy and filled with milk or meat. For the most part though, carrying groceries ends up keeping you slightly warmer than you would have been otherwise, and the trade off is usually worth it. 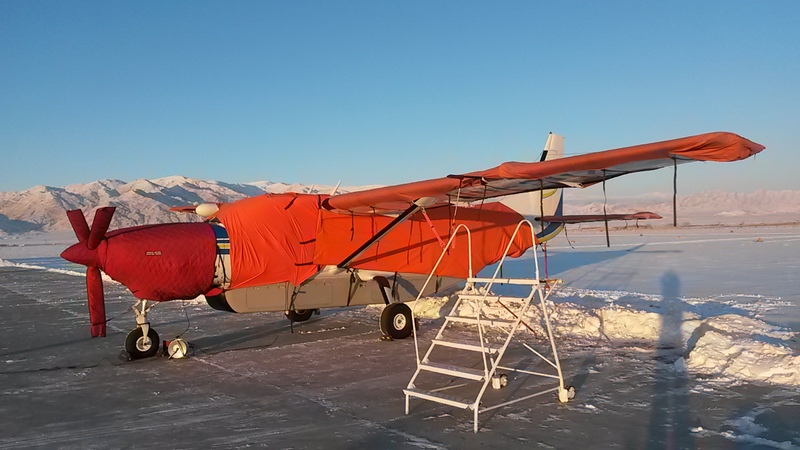 When staying overnight in the country, I must also bundle up my plane against the cold weather for the night. Well, that's my ranting and raving about the winter weather here for now. Oh, there are a few differences. Here, the cold weather is a constant. There are no chinooks. From the end of November until March?? April?? the weather stays cold, the only difference being the degree of coldness. We won't see many days in the teens (the negative teens) until spring, but will live consistently in the -20's and 30's for most (or all) of the next few months. I'm sure that we will miss the occasional chinook flow, but that's just life here and it's really not that bad. There is also much less snow here. Streets and roadways are cleared by people with shovels and brooms. When I see that I try to put that into a northern Albertan context, and I wonder how much of the highway between Sexsmith and Grande Prairie would be cleared before the next snowfall if the highway there was also cleared by people with small shovels. I imagine that the vast majority of roads would never be cleared in Canada if they were cleared in a similar fashion to here. Having said that, it works for here. Less snowfall is just one of the things that happens when you live on the edge of a desert. Merry Christmas to you wherever you are. Whether you are enjoying your Christmas out on your green lawn or are looking forward to going skating on the dugout, whether life is great right now or if you are going through a tough time, may you be reminded of the reason we celebrate Christmas. Jesus came to earth not only to live and die, but then to rise from the dead for us. May you feel His love for you and be encouraged this Christmas season.